Artron is the foremost printing enterprise in China. As the core project of Artron’s printing culture industry, they are actively creating artists’ archives. Moreover, since the site is at the periphery of the city, the art center will need to be conceived with a one-stop multi-service printing facility and cultural center. 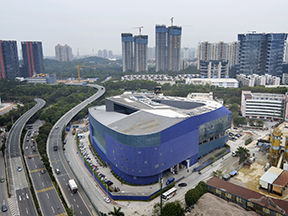 The site of Shenzhen’s Artron Art Center is located on the city edge, surrounded by three highways. In order to keep away from the noisy and chaotic environment, the building is idealized to be a landmark to define this area. Since the main view of this building will come from the three adjacent highways, the building shape is continuous and integrated with the large-scale urban infrastructure to form a dialogue between the two. On the premise of formal integrity and continuity, the gaps between the different parts of the volumes were created to bring people the comfortable visual impression when walking in the area. On the other hand, a triangular plot was reserved as a public park on the corner of the site to improve the urban environment. Observing from this small park, each side of this building is different. For the inner space of this building, the wreathed volume encloses an inner sky garden connecting art center, printing factory, office, the ground public space and is shared by the different departments. This inner sky garden blocks the noise from the outside. is isolated from the public functions on the ground floor and placed in parallel with the corporate headquarters. Elevating those two parts to the top floor, the art museum has the chance to create the effect of an independent art space. The move created opportunities to provide multiple choices for traveling in different routes to create a rich internal experience.